Update 3: The curtain has finally fallen on the Heroquest 25th Anniversary Kickstarter. When we originally reported the news I used the word cancelled, instead of suspended as was factually correct. Now in a statement to it's backers and publicly on their website, Gamezone have informed the world that they will be cancelling the project. Machina Arcana caused quite a stir at Essen Spiel 2013 and it has been a game I’ve been looking forward to since it was announced. Well the Machina Arcana Kickstarter has just started and I got a chance to speak to the game’s creator about the game, Lovecraftian horror and exhibiting at Essen. Essen has been shut down for another year but the board game news just keeps coming. This month we’ve got a Japanese card game from the makers of Love Letter, the start of a series of games from Plaid Hat and yet another Descent expansion. 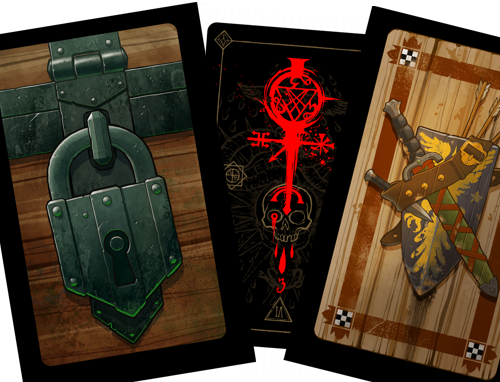 And for those card game fans we have a new competition friendly way of getting cards for your favourite LCG. There comes a time when you feel sorry for someone working in a call centre. A whole day on the phone talking to irate customers complaining about the price of their gas bill while having to stick to a script and never deviating. You may feel sorry for them but in Worker Placement, the latest game from Dyskami Publishing, currently raising funds on Kickstarter, that pang of pity lasts only for a few seconds as at some point you’ll give someone a job in a Call Centre and you’ll take that money. Darklands the mythical miniatures war game smashed its £20,000 target with a whopping £138,533. Unfortunately Xi Cards, managed only to secure half of its funding goal. Project creator Chris is now looking for a ‘more gradual’ release schedule. Larceny scraped through its funding goal raising just $552 over its $15,000 goal. Ortus will be making its way to backers when it raised $16,522 dollars for a $6,000 goal.